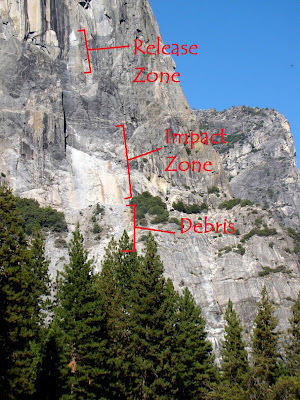 A follow-up to yesterday's post about the rock fall in Yosemite Valley: the rockfall is still being analyzed, but according to Greg Stock, Yosemite's park geologist, the event yesterday near Horse Tail Falls is probably the largest mass wasting event in the valley this year. They are using a LiDAR scan to calculate the size of the chunk of rock that fell. A preliminary report on the fall on a climber's site has a much better picture of the event itself, and a before/after shot of the release point. There were a total of three rock falls, a small event at about 11:30 AM, a much larger fall about three minutes later, and another smaller fall at about 1:00 PM. Thanks, Greg, for the info. More updates as they become available! The scar and impact zones can be seen in the photo above. Several large rock falls occurred from near the East Buttress of El Capitanon October 11, 2010. The first rock fall occurred around 11:30 am, and was followed about three minutes later by a much larger rock fall. A third smaller fall occurred at around 1 pm. All three rock falls detached about halfway up the far eastern side of the southeast face of El Capitan, roughly along the path that Horsetail Falls takes when flowing. Rock debris hit a prominent ledge beneath the cliff and fragmented into smaller boulders, producing substantial dust; the dust cloud produced by the second impact was visible throughout Yosemite Valley. Boulders did reach the base of the cliff, but did not impact any trails or roads. Although there were many climbers on El Capitan at the time, there do not appear to have been any injuries associated with these rock falls. However, climbers are cautioned that future rock falls from this area arepossible. I'd have rather been in your position than the climbers but they sure got some great shots. Wild Planet Day at MJC: Science is COOL! Balancing Boulders and Erratic Rocks! It's Fossil Day during Earth Science Week! A Sunday Night's "So What Is It?